This disc was auctioned in March 2005. It's difficult to say which version this is but it would certainly be either the take from 26 January 1969 [DDSI 26.74] or 31 January 1969 (take 27A) since those two takes were chosen for further work and mixing. 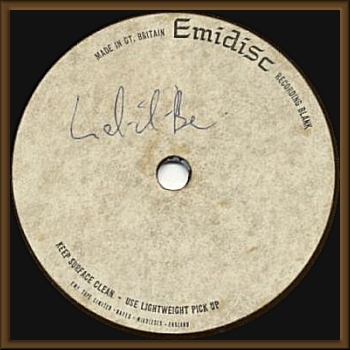 Since this is an Emidisc (other "Let It Be" acetates are on Apple), it seems possible that this might originate from the 8 january 1970 mixing session at EMI. An alternate mix of the single version circulates. Perhaps it is what can be heard on this disc.